The Chief Instructor of South East Academy is Peter Edwards, 6th Dan Black Belt. Along with many National and International titles he is British, European and World Champion. Peter has been training in Martial arts for over 30 years and has been teaching the 'Art' for over 20 years. He has been an active member of the world respected W.A.K.O. GB team since 1986 and is now also the Chief Coach to the British Squad. His teaching has brought great success to many of his students. The Classes are structured in a manner to build the ability and technique at a speed that is suitable for the individual. Instructors are taught to warm up all students thoroughly before commencing any techniques to prevent pulled muscles and injury.Time is spent on stretching muscles of the body to enable students to perform dynamic movements safely and effectively, and various exercises are used for full body conditioning to improve stamina, strength and co-ordination. Strike shields, focus pads, protective equipment and skipping ropes are regularly used in training sessions. The South East Academy is well known on the the tournaments scene. Students who are interested in competing in tournaments are encouraged, but we do respect the wishes of students that do not wish to compete. 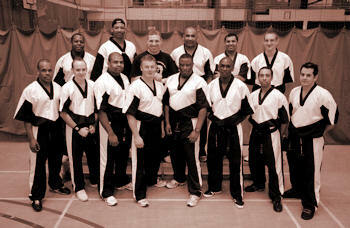 SE Academy of Martial Arts has produced two World Champions, and multiple European and Domestic champions. When students join the South East Academy, membership is for a life time. The price includes our popular black & red top quality club suit, and entitles students to train at any of the South East Academy classes, provided fees are up to date. Included in the startup fee is a licence which is renewable anually. This enables the students to take recognisable grades and provides insurance which covers each student in the unlikely event that any harm may be caused to or by them. All of the South East Instructors have been checked for their suitability for working with young people via the Disclosure and Barring Service (DBS - originally known as CRB). They also have child protection training, have up to date first Aid certificates and are fully insured to teach.